Astronomers using ESO’s Very Large Telescope have detected a stellar-mass black hole much farther away than any other previously known — 6 million light years. With a mass above fifteen times that of the Sun, this is also the second most massive stellar-mass black hole ever found. 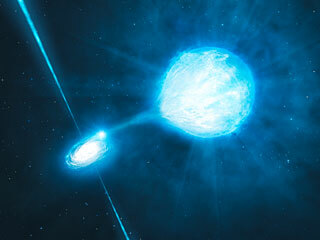 It is entwined with a star that will soon become a black hole itself. The stellar-mass black holes  found in the Milky Way weigh up to ten times the mass of the Sun and are certainly not be taken lightly, but, outside our own galaxy, they may just be minor-league players, since astronomers have found another black hole with a mass over fifteen times the mass of the Sun. This is one of only three such objects found so far. 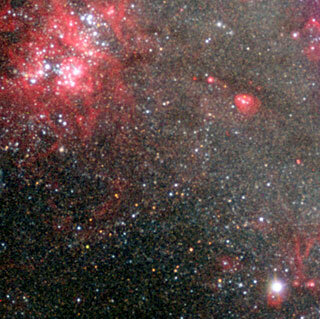 In 2007, an X-ray instrument aboard NASA’s Swift observatory scrutinised the surroundings of the brightest X-ray source in NGC 300 discovered earlier with the European Space Agency’s XMM-Newton X-ray observatory. “We recorded periodic, extremely intense X-ray emission, a clue that a black hole might be lurking in the area,” explains team member Stefania Carpano from ESA. Thanks to new observations performed with the FORS2 instrument mounted on ESO’s Very Large Telescope, astronomers have confirmed their earlier hunch. The new data show that the black hole and the Wolf–Rayet star dance around each other in a diabolic waltz, with a period of about 32 hours. The astronomers also found that the black hole is stripping matter away from the star as they orbit each other. Astronomers believe that a higher concentration of heavy chemical elements influences how a massive star evolves, increasing how much matter it sheds, resulting in a smaller black hole when the remnant finally collapses. 1. Stellar-mass black holes are the extremely dense, final remnants of the collapse of very massive stars. These black holes have masses up to around twenty times the mass of the Sun, as opposed to supermassive black holes, found in the centre of most galaxies, which can weigh a million to a billion times as much as the Sun. So far, around 20 stellar-mass black holes have been found. 2. In astronomy, heavy chemical elements, or “metals”, are any chemical elements heavier than helium. 3. Predicted by Einstein’s theory of general relativity, gravitational waves are ripples in the fabric of space and time. Significant gravitational waves are generated whenever there are extreme variations of strong gravitational fields with time, such as during the merger of two black holes. The detection of gravitational waves, never directly observed to date, is one of the major challenges for the next few decades. 4. The LIGO and Virgo experiments have the goal of detecting gravitational waves using sensitive interferometers in Italy and the United States. This research was presented in a letter to appear in the Monthly Notices of the Royal Astronomical Society (NGC 300 X-1 is a Wolf–Rayet/Black Hole binary, P.A. Crowther et al. ).